A great thing about observing the Moon is that it is easy to find and very bright (perhaps too bright) so that it can be one of the best objects for a beginner to study. Any telescope can be used and a “Moon filter” used to reduce its brightness so that it does not dazzle the eye. Even better, a polarising filter can be obtained from about £28 for use with a 1.25 inch eyepiece or £40 for use with a 2 inch eyepiece. Each filter set consists of two polarizing filters, one which can be rotated in its cell to adjust the brightness down from ~40% to ~2%. This allows one to progressively dim the view of the Moon to the desired level whilst, at the same time, increasing contrast, reducing glare and so increasing the amount of detail that can be studied. In this short series I will first point out some of the aids that can help when planning lunar observations and then describe some of its most interesting features. 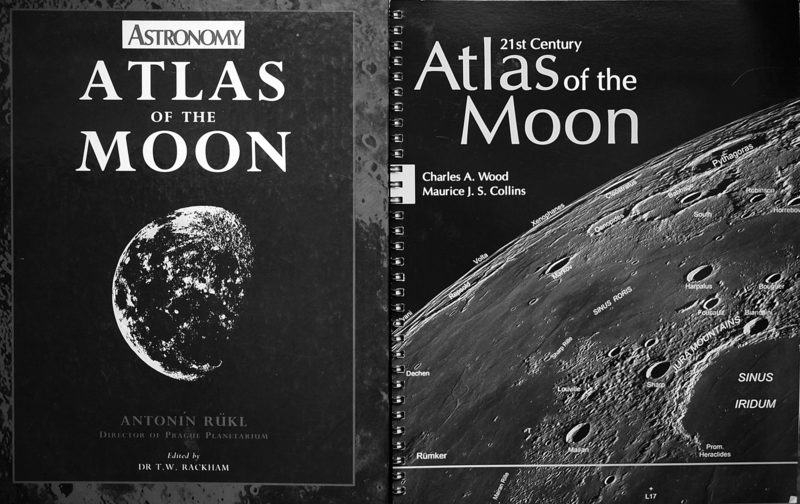 The, large scale, ‘Times Atlas of the Moon’ is based on the Lunar Surveyor images and charted by the US Air Force. This is the highest resolution lunar chart available and can be bought second hand for ~£64. A classic Book with excellent descriptions of lunar craters and features written by Patrick Moore is ‘The Moon’ by Wilkins and Moore. It includes very detailed maps drawn by Wilkins. This can sometimes be found second hand but is now quite rare. 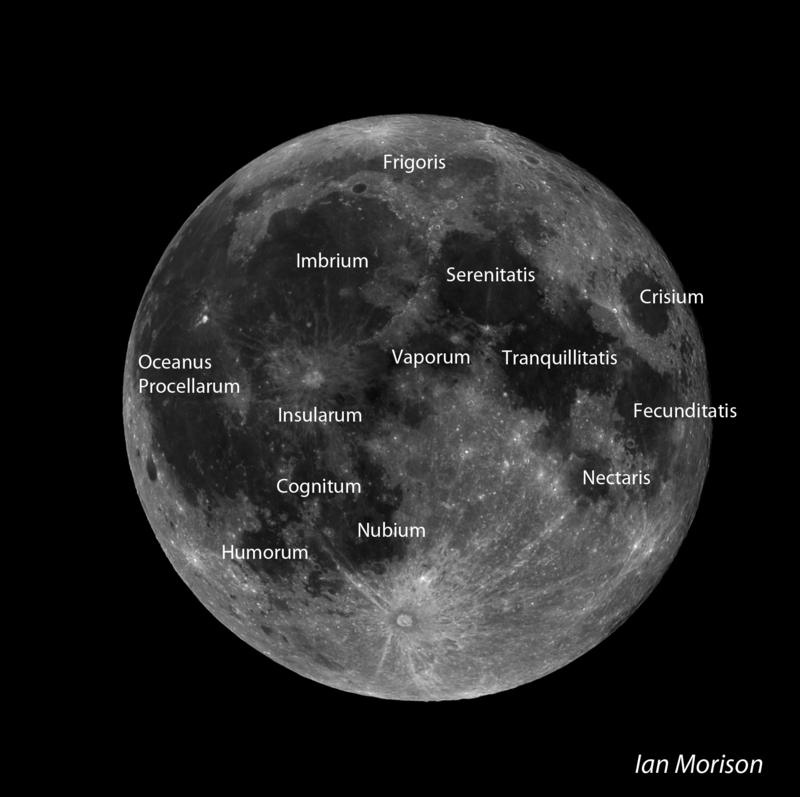 ‘Phillips Night Sky Atlas’ by Robin Scagell is a superb book for beginners and it has an excellent chapter on the Moon containing four, beautifully drawn, lunar quadrant charts. There is one piece of free software that every lunar observer should have and that is the ‘The Virtual Moon Atlas’: https://virtual-moon-atlas.en.uptodown.com/windows. It plots an excellent chart of the visible part of the lunar surface for any chosen date and time and will provide detailed information about any feature that is selected as shown in the figure below. 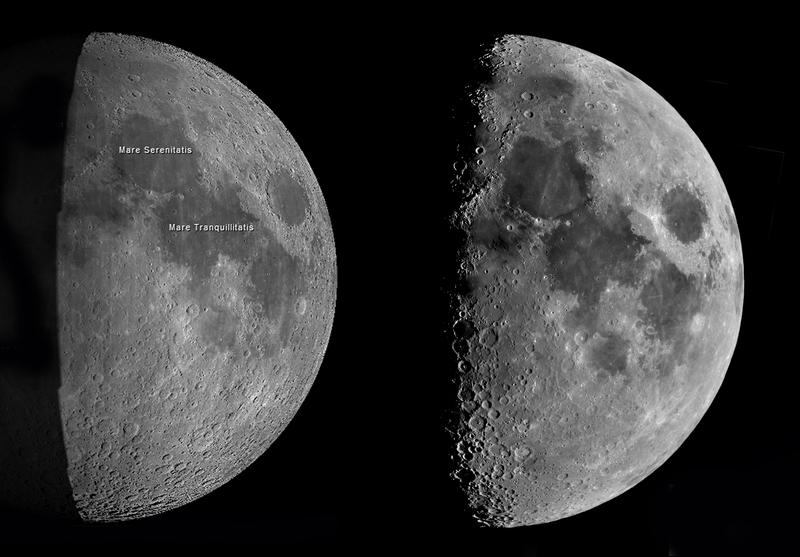 A comparison of its chart and the author’s image at the same lunar phase is shown in the image below. The Moon orbits the Earth in an elliptical path so that its distance varies from 356,400 km at perigee to 406,700 km at apogee. Its angular size thus varies from 29.4 up to 33.5 arc seconds and when at its furthest distance cannot fully cover the Sun’s disk during a solar eclipse so that an annulus of the Sun surrounds the dark lunar disc and one sees what is called an ‘annular eclipse’. The period from one New Moon to the next, called a synodic month or lunation, is 29.5 days. Though the Moon is tidally locked to keep one face towards the Earth, its elliptical orbit makes it appear to ‘wobble’ a little and this allows us, at times, to see some of the far side with, over time, 59% in total of the lunar surface visible from the Earth. 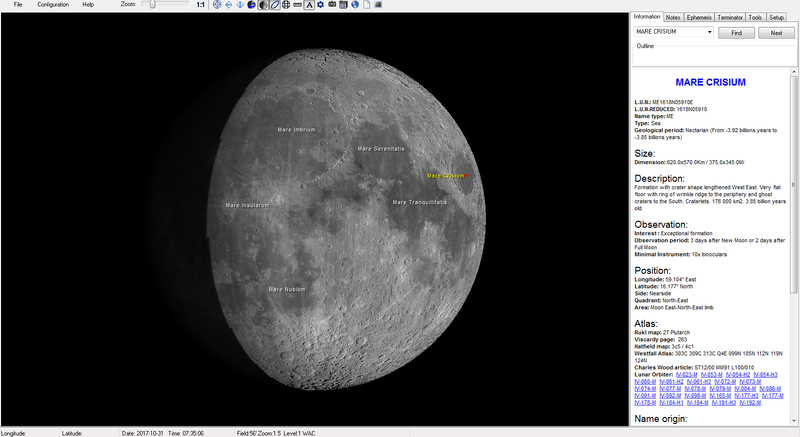 Virtual Moon Atlas can beautifully show the Moon’s libration simply by holding down the left mouse click over the “>>” tab in the ephemeris command window. The April 2004 issue of Sky and Telescope published an article by Charles Wood listing 100 of the most interesting sights to observe on the Moon. The ‘Lunar 100 Observing Club’ provides an observing log that can be used to record your observations and an excellent website: http://www.astrospider.com/Lunar100list.htm includes many images of the individual lunar regions and gives links to further related websites. Even visible with the unaided eye as the ‘Man in the Moon’, the lunar maria are, perhaps, its most striking feature. The name Mare or, the plural, Maria comes from the latin ‘sea or seas’ as, in the 17th century, they were thought to be seas. Their relative darkness separates them from the lighter lunar highlands. This darker hue results from their chemical composition. The brighter highland regions are rich in calcium and aluminium whilst the darker maria are made up of basaltic lavas containing large amounts of magnesium, iron and titanium. If one enhances the colour in a lunar image (it is not just a monochrome object) it is seen that Mare Tranquillitatis has a bluish hue whereas the adjacent Mare Serenitatis is reddish in colour. The former is due to the amount of titanium in the basalt compared to the latter which contains more iron. For reasons that are, as yet, not fully understood, the maria cover 31.2% of the near side of the Moon, but only 2.6% of the far side. From the fact that many are circular in shape, such as Mare Crisium, it is suspected that at some point volcanic lava flows of magma erupted and filled large impact basins on the lunar surface which had been formed by a series of immense impacts some 4,000 million years ago. It is believed that these lava flows were the result of radioactive heating at depths of 100-200 km which melted the underlying rocks between 3,500 and 3,000 million years ago. One possible reason for the disparity in the number of mare seen on the far side compared to the near side is that it appears that the lunar crust on the far side is significantly thicker than on the near side making it less easy for magma to reach the surface. The image above is an annotated image of the Full Moon taken by the author using a ‘webcam’ to take and process video sequences of many small segments of the surface which were then composited together by the free software program Microsoft ICE (Image Composite Editor). By helping to remove the effects of the Earth’s atmosphere this enables higher resolution lunar images to be made.